Are you ready to check out the second of my Elemental Styles polishes? This one is called 25 Manganese, Please!, and in addition to continuing to follow the periodic table theme, this one's name is also rhymey! I love it! 25 Manganese, Please! is a teal-blue shimmer in a dim greyish base. My photos look pretty blue but it does look greener at times. It is pretty sheer so I layered it over a black creme for maximum color poppage. My photos show one coat over black. It was easy to apply and easy to control. 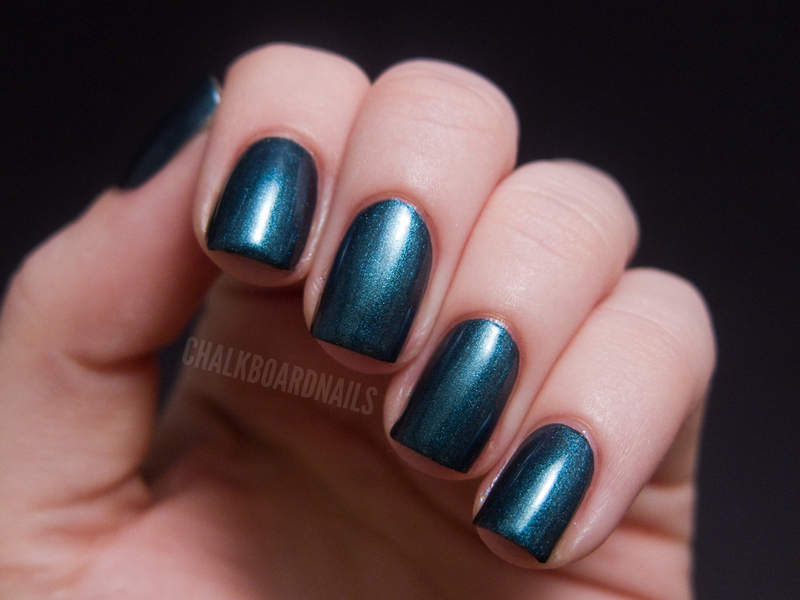 I am a fan of these shimmery type polishes, and the color on this is really nice. Manganese, Please! retails for $7.50 on the Elemental Styles Etsy. Go give it a look! I really like the colour! It's super cool! That is really pretty! And such a neat collection. Just came across your blog :3 You've got a new follower! Nice color! Can it be built up to opaque on its own? Yes, it can, but it will take 3 or 4 coats. Love that colour, your photo's are amazing! I have this and 7 others of her color change topcoats-so awesome! I just love her polish!